Helps eliminate ugly razor stubble. So effective at reducing friction you’ll be less likely to cut or scrape your skin. This superior shave gel has the best lubricity! Try rubbing it between your fingers and see for yourself. It simply doesn’t dry out! 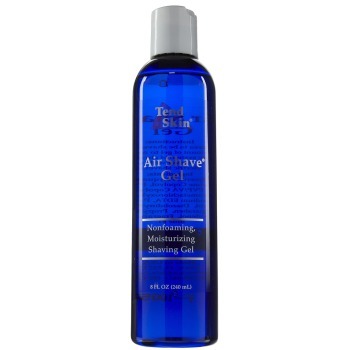 Air Shave Gel does not “lather”. Simply apply and shave. Men, try it with the new Panasonic Wet/Dry electric shaver in the shower! You’ll shave closer than ever! Air Shave Gel leaves your skin with a satin like feeling and fully moisturized, not dry like other shaving gels and creams. The gel is so effective at reducing friction, you will be less likely to cut or scrape the skin. For those with severe psoriasis, razor bumps, or other skin disorders with severe crusting or surface roughness, Air Shave Gel is a blessing. Many commercial shave gels and lotions will cause a burning sensation on raw skin surfaces such as those with psoriasis or similar problems. Our gel will not only allow ease of shaving, but its moisturizing properties will generate soothing relief for hours.